WASHINGTON, DC – Bureau of Land Management Director Robert Abbey announced today that he will retire from public service at the end of May to rejoin his family full-time in Mississippi. Appointed by President Obama in 2009, Director Abbey’s three-year tenure in leadership of the nation’s largest land management agency marks the culmination of a 34 year career of state and federal service. (Unedited) ~As part of the Bureau of Land Management’s ongoing effort to engage volunteers in the stewardship of U.S. public lands, BLM Director Bob Abbey announced today that he has approved nearly $300,000 in the current fiscal year for 12 projects aimed at improving Western rangeland conditions where wild horses and burros roam. 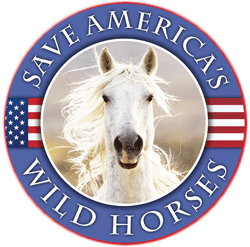 The on-the-ground work will also support the BLM’s forthcoming strategy to put its national Wild Horse and Burro Program on a sustainable path, as called for by the Government Accountability Office and members of Congress. While trusting Americans calmly slept all snug in their beds dreaming of freedom, blue skies, green grass and the thundering of distance hooves the grotesquely distorted and immoral monster, known as the Department of the Interior (DoI), was plotting on collusive and divisive ways to kill off the national icon of American freedom and independence, the wild horses and burros of the western United States. Join thousands of concerned and caring Americans around the country. Protest Interior Secretary Ken Salazar’s appointment of Callie Hendrickson to the BLM National Wild Horse and Burro Advisory Board as the General Public Representative.